In 2009, we launched a major programme to replace some of our older and least energy-efficient properties, bringing them into line with the national Decent Homes standard. Our plans required the demolition of 40 houses in desperate need of maintenance. In their place, we would build 80 brand new, affordable and energy-efficient homes that would save money for both our tenants and ourselves in terms of up-keep and running costs. By providing twice the number of properties, we would also be helping to address the demand for affordable homes. A project of this scale required major planning and regular consultation with tenants to make sure they were informed and involved every step of the way, particularly as we were moving many of them into temporary alternative accommodation. They also had the chance to input to the design of their new home. We are extremely grateful for the support they gave us during this period of significant disruption. The entire programme cost approximately £9.5 million, which included £1.8 million of Homes and Communities Agency grant funding and a contribution of £156,000 from the local authority. 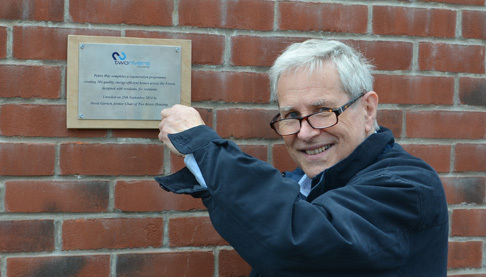 We marked the completion of this major scheme with a small ceremony and plaque unveiling at Pylers Way in Lydney, after the last residents had moved into their new homes. I really like the house. It’s ideal for what we want and everything is brand new.